Take US-23 South past I-96 to Exit 39 (Geddes Road). Turn RIGHT (west) into the traffic circle and take the second exit from the circle to go over US-23. Stay to the right through the next traffic circle and take the first exit from the circle to remain on Geddes Road. Turn RIGHT (south) at the first traffic light onto Dixboro Road. Continue on Dixboro across the bridge and through the traffic light where the road becomes Huron River Drive. Stay on Huron River Drive past the Washtenaw Community College Campus on your right. Once past the Community College, get into the left lane and turn LEFT into the St. Joseph Mercy Campus. Follow the signs to the meeting location. Take US 23 North to Exit 39 (Geddes Road). Turn RIGHT (east) in the traffic circle onto Geddes. Stay in the right lane on Geddes and turn RIGHT (south) at the first traffic light onto Dixboro Road. Continue on Dixboro across the bridge and thru the traffic light where it becomes Huron River Drive. 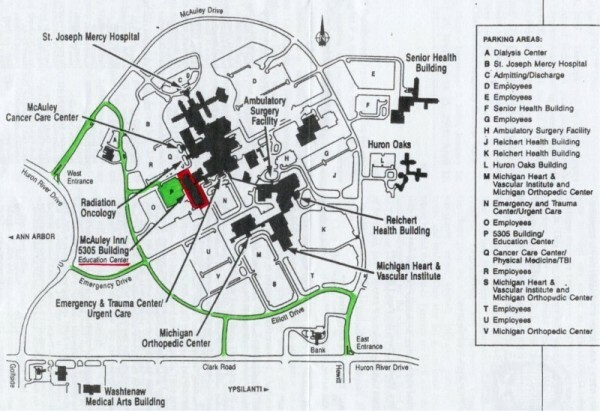 You'll pass Washtenaw Community College on the right. 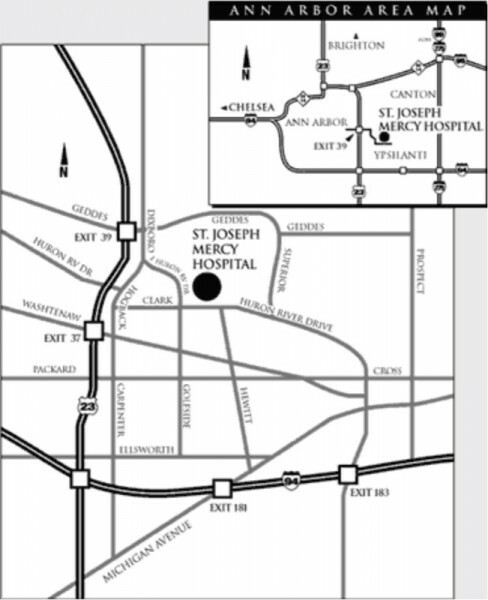 Get into the left lane, and turn LEFT into the St. Joseph Mercy Hospital campus.